Coarse, cementitious acrylic adhesive, reinforced with resins. It has strong adhesion, and high bonding strength. It is resistant to moisture and temperature changes. Suitable for linings with cement or ceramic bricks as well as with irregularly shaped slabs. Use it to install both indoor decorative finishes and outdoor building facade linings. When using the white adhesive to also grout the installation surfaces, there is the option to color it using Durocolor Powder-C pigments in powder form permanently. Classified C2T per EN 12004 (MIRTEC/Cert. No. 3357). 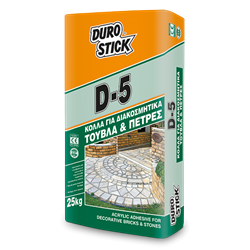 5-10kg/m², depending on the surface smoothness, as well as the width and depth of the joints.